We’re rolling out the red-and-green welcome mat for members and friends at our San Francisco Railway Museum the weekend before Christmas. There’s something appealing for all ages! Family Day Streetcar Charter, December 19, 1-4 p.m.
On the Saturday before Christmas, we have a special welcome for families at the museum. Treat your young trolley lover to a special chartered ride on one of the vintage streetcars our members decorated for the holidays. We’re scheduled to use car No. 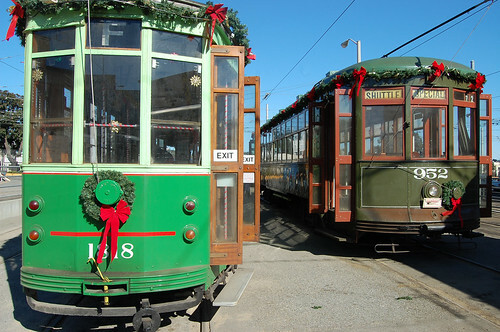 952, the 1924 New Orleans “Streetcar Named Desire.” You’ll get a kid-friendly, nonstop ride to Pier 39 and back on the decorated streetcar, with music of the season playing along the way. Each child will also receive a copy of our streetcar activity book and a genuine slice of 19th century San Francisco cable car rail as a souvenir. Departures from the San Francisco Railway Museum will take place approximately every 45 minutes. While you wait, you and your kids can enjoy the museum’s interactive exhibits, including a full-scale mockup of a streetcar motorman’s cab and a wooden railway playset. Come early and make a day of it by visiting the fabulous Ferry Building Farmers Market first or going ice skating at Embarcadero Center. Ride the charter to Pier 39, say hello to the sea lions, and then we’ll take you back again. We hope you will bring other families who might enjoy this special day as well. For Market Street Railway members, we’re offering a special sale, featuring 20% off all merchandise – an extra 5% discount this weekend only. And you can join MSR on the spot to enjoy the extra discount right away. Members’ Day, December 20, 1-4 p.m. The Sunday before Christmas is a special day for members. Come to the museum and see our latest exhibits, including the 1927 “White Front Car” model with its accompanying history of the old Market Street Railway. We’re offering all members an additional discount for a total of 20% off our store merchandise that weekend only, including some great Christmas cards like the one pictured here. MSR Directors will be there to answer your questions about our projects and activities, and we’re working on more special activities and speakers, including efforts to get special streetcars out for the Embarcadero shuttle that day. Check back for the latest information and schedules. This is a great opportunity to bring friends and join them up as well. Come on down that weekend. It’s a great way to show your support of MSR and enjoy special savings and extra fun.